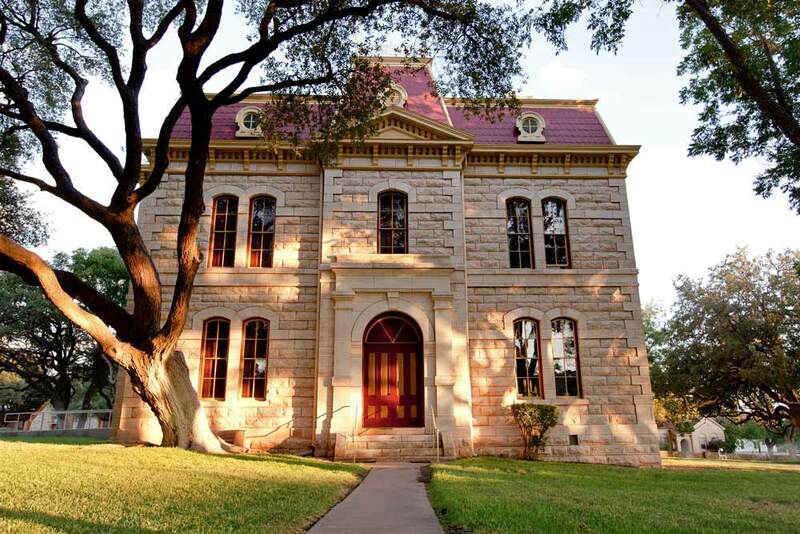 The Heritage of Sonora and Sutton County can be seen and sometimes heard and includes the original well site on the lawn of the 1893 Courthouse designed by Oscar Ruffini, the first jail - which now houses a museum - the 1889 Miers Home Museum, and the Depot with its outdoor amphitheater. The Courthouse Square is located at Water Avenue and Oak Street. There are brochures for self-guided walking tours located in front of the courthouse next to the historical markers. For more information on nearby historic downtown locations, please click here. "An afternoon tour of Sonora starts at the newly renovated Sutton County courthouse, designed by architect Oscar Ruffini and built in 1891. During restoration, contractors uncovered a gold-stenciled border believed to have once lined the courthouse’s rooms and halls. Based on that discovery and old photos, conservators meticulously hand-stenciled and -painted Victorian-style motifs in gold and copper. The borders beautifully accent the courthouse’s sage green walls, not to mention the original pine floors, wooden railings and furnishings in the upstairs courtroom. On the square also stands the two-story Sutton County jail, constructed in 1891 of native stone. Although the jail’s four upstairs cells offered the latest in plumbing fixtures, Sonora’s water pressure wasn’t strong enough to get water up to them until 1895, when the waterworks were moved from the square to a nearby hilltop. The now-empty jail housed prisoners until 1980." General information including contact information and location and directions for/to this location can be found below. Return to the main directory by clicking the button below.